Unfortunately, they're no good at it! 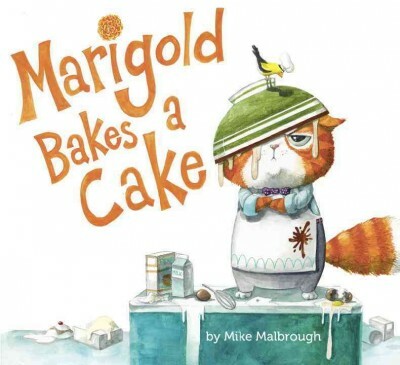 Turns out that some things just aren't for birds, as Marigold discovers in the last spread where, rolling pin waving and fangs out, he chases the birds out of his kitchen. Malbrough is originally a teacher, artist, and has experience in graphic design which definitely shows in his debut picture book. The comic timing is just right and Marigold's expressions are some of the funniest parts of the book. 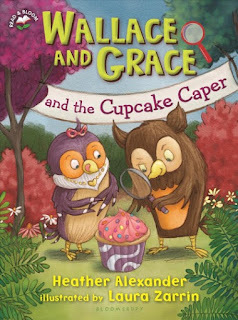 The illustrations, including birds in hats, are lush and colorful and the brisk rhymes add a touch of alliterative humor. The ending made me laugh uncontrollably - it certainly isn't the typical "let's all be friends together" ending of a picture book. This one will definitely appeal to older kids with a sense of humor and those who enjoy chaos. Verdict: An additional purchase, but a fun one! Scientists in the Field is always doing something new; breaking new ground in showing the real lives and research of scientists, including a diversity of opinions and experiences by including non-Western perspectives and the lives and concerns of locals and how science and research affects them. 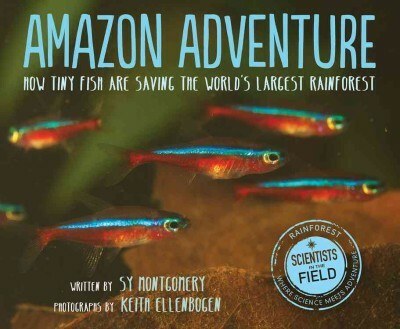 This latest book continues that tradition by combining science, economics, and culture to show readers how something as small as aquarium fish can have a big impact on the lives of people. Author Sy Montgomery, photographer Keith Ellenbogen, and aquarist Scott Dowd introduce readers to a small community on the banks of the Amazon river. Supported by the capture and export of piabas, small, brightly-colored fish, the community faces many challenges. Competing breeders in the US, the struggle to safely and humanely export fish, and well-meaning aquarists who are trying to avoid wild-caught fish. Montgomery weaves together the color and excitement of a local festival, the Scott Dowd's own journey as a scientist, the lives of locals, and a wider picture of the Amazon rainforest and it's current state to create a strong, multi-faceted narrative. I really want to push this book at kid and parents and say READ THIS. It's all about science, making the world a better place, learning about other cultures! But it's hard to get kids, who often don't have the reading ability to tackle a challenging title like this, to relate to a book set so far away from their small town, midwestern lives. It's not often that a kid will pick this up on their own, when they'd rather read fantasy, or comics, or scary books, or National Geographic factoids. This is when I feel lucky that I have such a great relationship with our school district, teachers and librarians. They have gate-keeping abilities that I don't, as well as more access to kids. When I get requests for selections of high-level reading materials, science narratives, and research topics, I can use my expertise to recommend books like Amazon Adventure, which teachers aren't familiar with, and so get them into the hands - and hopefully minds - of readers. Verdict: This is a powerful and hopeful book, full of interesting stories about the lives of people, scientists, and the river that they need to survive. It's one I definitely want to have on hand to recommend to the right reader and the right teacher to get it into the hands of kids who will be the future aquarists, authors, and scientists. Managers' meeting on Monday, on Tuesday I found out I have to move a bunch of stuff in the basement - bittersweet since, on the one hand, the basement REALLY needs to be cleaned on the other...omg I just organized it in August! *sob*. Another small group at Messy Art Club. I'm continuing the after school clubs through May, but then I'm doing something else for the summer and will re-evaluate for the fall. An average of 20-30 people isn't bad, but it's not what I've been getting in the past. Very enthusiastic 1st graders - they played our five senses/guessing game and picked out books. For the first time in I can't remember how long, I did NOT have to haul stuff around in the basement! Because I made one of my aides do it all on Wednesday and Thursday... My staff and I shifted books mostly. I can see clearly the sections that need filling out in nonfiction now - I'm still going to need to weed more picture books though. When we change to neighborhoods in 2014 I had 4,000 titles. Now I have close to 6,000 and circ is slowing because it's so crowded! I went over to Health and Human services at the end of the day - my school colleague invited me to join in a county wellness initiative that's planned for May. I think this will tie in with our garden plans and possibly Library on the Go. This is the sixth and latest installment in Humphrey's Tiny Tales series, a younger version of the popular series "The world according to Humphrey." It features Humphrey the school hamster on little adventures with friends from school. Humphrey is quite eager to participate in everything, but sometimes disappointed that the kids can't understand his squeaks. On this adventure, Humphrey has an important mission. He and the classroom frog have gone home with Garth (and his little brother Andy). 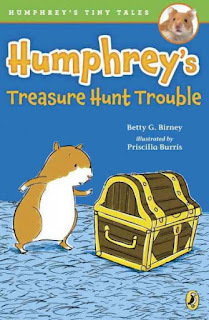 Garth is making a treasure hunt for his classmates and he gives Humphrey the most important job of all - guarding the treasure chest that holds the prize! Humphrey does a good job, not taking even one peek, but in the middle of the night a thief takes the treasure chest! Can Humphrey solve the mystery and find a new treasure, or will the hunt be spoiled? Burris light illustrations add interest and humor to the story, keeping beginning chapter readers going through the text. There's a larger font and more white space on the pages as well. This is one of the series that I think works well with a younger chapter book audience; even if they're not familiar with the longer Humphrey books, they can pick up the storylines with no problem and a class pet is always a popular character. I would like to compare the books and see how many of them feature diverse kids as opposed to them being the friends of the white kids who are featured, but I haven't had time to check each book. Verdict: I have fans of both Humphrey series and this is a solid addition. Recommended. I'll be honest - this is not the type of book I personally enjoy. There's just too much interpersonal drama. BUT it's a book that the kids absolutely love and it's flying off the shelves faster than I can recommend it! Jamieson returns to the world of friendship, drama, and middle school with an unusual setting - the Renaissance Faire. Imogene has been homeschooled and basically lived at the faire where her parents work. But now she's ready for a new adventure - middle school! She's happy with her quirky clothes, renfaire friends, and especially thrilled with her new status as a squire. But when she gets to middle school, none of that matters. Her renfaire friend is picked on by all the cool kids, the teachers are mean, and she sticks out like a sore thumb. Things just get worse and worse until, in her desire to be accepted and fit in, she does something really awful. Now Imogene is an outcast at school and in her own family. Her little brother hates her, she's lost her squire status, she has to be tutored by the renfaire workers she's looked down on, and her erstwhile friends - on both sides - will have nothing to do with her. It will take some serious thought about what it really means to be a brave knight - and a friend - for Imogene to try and repair some of her damaged relationships and fix the things she's done wrong. Jamieson's colorful art is reminiscent of Telgemeier's style, one of the reasons it makes a great read-alike - but she has a style all her own. Imogene's everyday life is interspersed with her own imaginative journeys into a fantasy world where she, a brave knight, slays dragons. The scenes in the Renaissance Faire will attract both faire aficionados and those who've never been, showing plenty of fun activity, a diverse group of people who work together as a family, and helping readers see both sides of Imogene's dilemma as she tries to fit in at school and still be true to her family and herself. Jamieson does a really good job showing the difficulties Imogene gets into and how bullying isn't always simple and clear-cut. Imogene's parents at first assume she's being bullied, since she's different than the other kids, and are shocked and horrified when they find out what Imogene has done. Imogene herself has some hard lessons to learn, including taking a realistic look at the choices she's made and where she's ended up. The other kids and adults are all shown as relatable, fallible people. Parents make mistakes just like kids and nobody is all good or all bad. The story also addresses the difficulties of going from a more casual, homeschooled environment to a public school. While I could wish that the "hippie homeschooler" stereotype hadn't been used, this is a more realistic picture of adapting to middle school that both homeschooled and traditionally schooled kids can relate to. Verdict: Readers who love the drama and angst of fitting in, figuring out friendships, growing up, and dealing with social anxieties will love this latest book, especially with its helping of faire fantasy on the side. 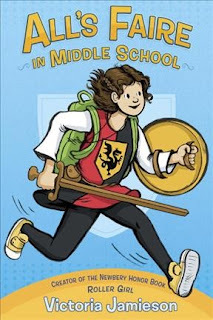 A great read-alike for Telgemeier and other slice-of-life middle school comics. Highly recommended. 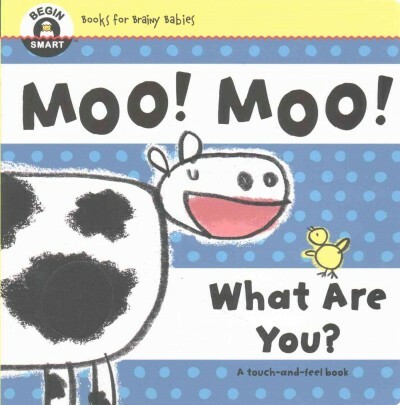 Read, Read, Read, said the Baby: Moo! Moo! What are you? This is another republished title from the previously out of print line Begin Smart, originally published in 2008 in Canada. I was pleased when Sterling started reissuing these as they're very attractive to parents and most of ours have fallen apart. 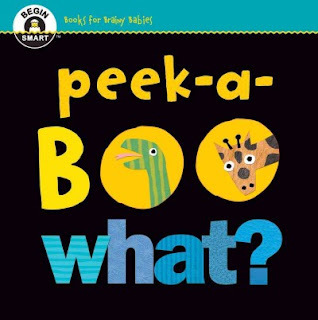 This title uses the familiar refrain of "peek-a-boo" and die cut holes, paired with touch-and-feel elements. A typical spread says "peek-a-boo" with the last "o" being a die cut circle revealing the texture of the next animal. Meanwhile the page shows the current animal and encourages children to touch it, "I see a fuzzy dog. Can you pat it?" There is a patch of orange fur for a cat, curly brown hair for a dog, white wool for a sheep, smooth textured pink for a pig, and short black fuzz for a cow. The art is childlike with big mouths, chicks decorating every page, and quickly sketched in lines and bold colors. The book is an extra-sturdy square of about 7x7 inches. Begin Smart includes a note to parents with recommendations on experiencing the book with their children and the back lists early literacy skills encouraged by the book. Verdict: Touchy-feely books don't last forever, but you'll get a lot of excellent use out of this one before it falls apart (or gets icky!). Recommended. I had completely missed this book until I got to ALA and they were handing out magnets (which one of our circulation clerk's children are enjoying at this very moment). So, marketing works! "Papillon is a big kitty. He is not fat. Just very fluffy." Thus begins the story of Papillon, a cat so fluffy he floats. Despite his owner's best intentions, dressing him in different costumes to keep him weighted down, Papillon is determined to float free. But when he sees a potential new friend, a little red bird, and goes outside to greet her... he floats away! Fortunately, there is a happy ending with a compromise between Papillon and his owner Miss Tilly and Papillon's new friend. The story is sweet and simple, gently quirky but with an adorable sweetness that listeners will sink into. For me, what really charmed me were the illustrations. Papillon is delightfully rounded and fluffy, with eyes that are often closed in sleep but occasionally pop open into sleepy dots. Readers can follow his friend, the little red bird, throughout the book from beginning to end and across the sometimes scary forest (in one scene the darkened forest shows an owl clutching a mouse and a snake eyeing some fledglings. 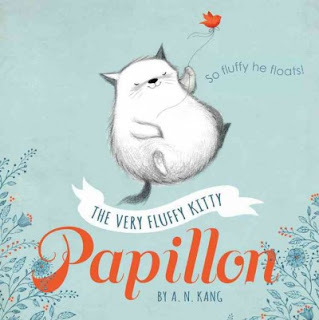 Verdict: Even if you didn't get any paper doll magnets (and I am totally in favor of a paper doll Papillon) you will adore this sweet story of a fluffy kitty and some good friends. I look forward to more stories about Papillon - the first one checked out almost before I could discharge it! I have been eagerly awaiting Sarah Albee's newest nonfiction title and here it is! Poison is, as she is careful to explain, not a how-to book (this didn't stop some coworkers from giving me leary looks over my lunch-time reading choices). It's not a grisly recounting of true-crime either, although some are included. 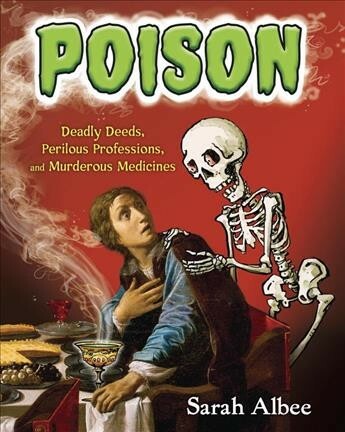 This book is a fascinating excursion through the history of poison, forensics, history, and food contaminants, up to the present-day. Albee talks about dangerous beauty products through the ages, how poison affected history, myths and legends, and the changes in poisoning caused by modern forensics and government involvement in food standards. Readers will learn about poisonous makeup, ink, paint, food, drink, plants, and much, much more. Extensive sources, back matter, and further reading that includes fiction and fantasy as well as nonfiction are only a bonus to this gruesomely funny book. Pair it with Gail Jarrow's medical mysteries, Georgia Bragg's histories, and of course all of Sarah Albee's fans will want to read it! Great for starting discussions about how our food is affected by laws, the choices people make about their appearance, and, of course, historical poisonings! Verdict: A fun choice for classroom, book club, or just on your own reading. Highly recommended. - Another busy week! OPtions is a virtual charter school - I reported on their library field trip and mentioned some ways we could potentially collaborate next year - library garden, etc. Only 23 people at Mad Scientists Club. The weather is gorgeous and everyone is outside before winter hits! Also, I'm behind on publicity and outreach so haven't been connecting with as many kids. Still, the kids had an awesome time, mostly playing with the "real" marble run I keep in the library. I had a marketing meeting with my associate on Wednesday - eventually she'll take over the marketing, but she's still in training. It's a lot to learn! I left early on Wednesday and went on an epic journey to Walmart to use up the last of the supply budget. I had a very involved group on Thursday. They didn't necessarily want to talk about their book club books, but they very definitely wanted to discuss the books that they liked. These were all 5th graders and most are very busy with school so I didn't get a lot of books taken, but everyone took at least one! The problem with buying almost any chapter book at this point in publishing history is that you're not just committing to ONE book. You're committing to a SERIES of unknown length and quality. Of course, there are a lot of benefits to series - they keep kids reading, meet that important need for repetition and familiar characters, and are just fun. How many tv series and book series do adults devour? Lots. But there has to be a limit on how many beginning chapter series I can invest in, especially since I have a limited space that I only update once a year for paperback series. Will this one make the cut? 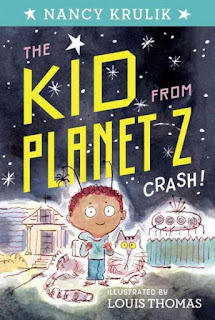 Zeke, his parents, and their commander Zeus have crashed - on Planet E! Earth is a long way from their home of Planet Z, but they're going to have to stay for a while because their ship is broken. That means Zeke is going to have to go to school and pretend to be human! Not only that, they're going to need to earn some money, somehow. Did I mention their commander, Zeus, is a cat? Each page is bordered by a blue pattern and the illustrations are blue-hued sketches. Zeke is biracial (and alien) and Thomas actually manages to get a reasonable number of children crammed into the classroom, even if they're only background shapes. 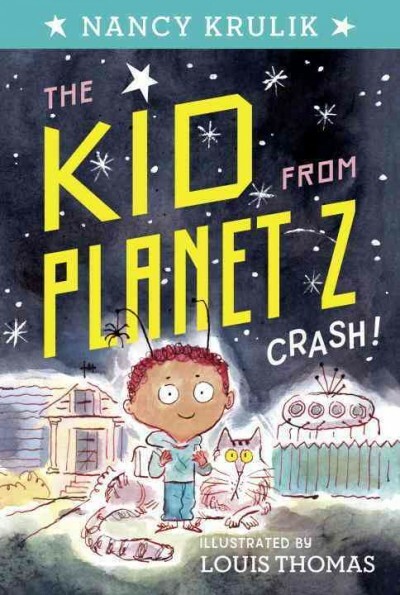 The book is mildly amusing, with a lot of familiar tropes - the alien kid who doesn't fit in, trying to figure out how human things work, etc. The addition of the cat stands out - he's intelligent but still a cat and definitely does not appreciate the discovery that cats are pets on earth. But does it stand out? It's funny and has a nice touch of diversity, but there are other alien chapter books out there like Space Taxi. It's not a genre I get a lot of requests for - the emphasis is more on "funny" than "science fiction" or "aliens" and I have a lot of funny beginning chapter books. Verdict: This is a decent beginning chapter book series, but it doesn't stand out enough to be added to my collection. I've just added a new series that mixes diversity, fantasy, and science so this is extraneous. It's a perfectly fine addition if you need it though. This is the first book I've read from Simon and Schuster's new imprint, Salaam Reads. It. Was. AWESOME. Farah's twelfth birthday is not going well. Even though her best friends Essie and Alex are there, she's uncomfortable with all the strangers her parents have invited and feels almost a stranger with her friends, now that her family has moved to a new home. She's also exasperated with her little brother, Ahmad. Usually, Farah is patient with him, knowing that his ADHD makes it hard for him to control himself, but today she just wants something for herself. Something like her strange aunt's present, a mysterious board game with unexpected powers. But Farah quickly discovers some things you can't handle on your own. Like it or not, Farah must lead her friends into the Gauntlet of Blood and Sand if she wants to save her brother - and all the other creatures and people trapped there. Farah is an amazing character - tough, determined, knowledgeable, but willing to ask for help and dealing with everyday issues in the midst of her fantastical adventure. Her friends are fully realized, with their own quirks and personalities, but never overpower Farah's place as the central character. The game world is almost a character itself, with evocative descriptions of the souk, the palaces, and the sand that flows everywhere. 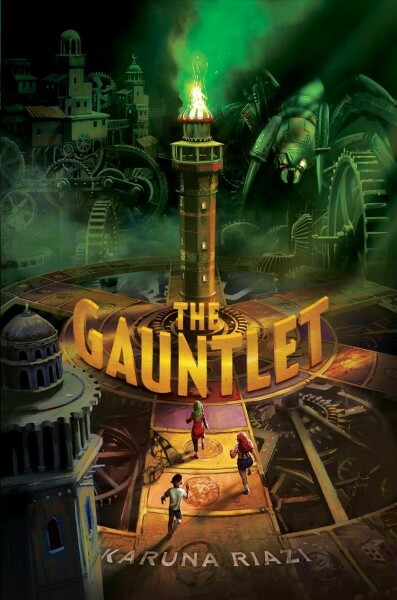 Throughout the story, the thread of games is woven; Farah's family loves to play board games and this knowledge helps her meet the challenges and solve the clues that will hopefully allow them to survive the dangerous world of the Gauntlet of Blood and Sand. Verdict: A riveting adventure with plenty of peril, excitement, and a series of great clues and games paired with a stellar set of diverse characters, this book is a must-have for your libraries and a top choice for book clubs and recommendations. Strongly recommended. In the past, I've sometimes disliked the I like to Read series because I felt the illustrations were lackluster, but I'm completely behind this delightful entry. I've been really enjoying Rotner's books with photographs - I think she's a bit of a modern Tana Hoban (whose books I've been weeding because she's no longer popular). This easy reader was just perfect for our quasi-rural community. 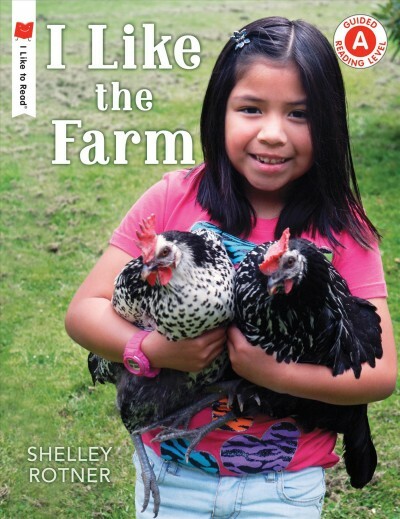 Each page features a different farm animal and many also show kids. There are cats, cows, dogs, pigs, and chickens. There's also a picture of a tractor and farmyard at the end of the story. The text is simple variations on the title, "I like the piglet." What I absolutely loved about this is that it showcases a wide range of diverse kids! Boys, girls, dark and light skin, Hispanic, African-American, and Indian. It's so rare to see kids of color shown in books about rural life. Verdict: Farm animals, an emergent reading level, and a diverse cast of real kids. This is the perfect addition to your easy reader section and I'll be buying several copies! It took me a little while to recognize Kraegel as the author/illustrator of a favorite of mine, the oddly sweet Song of Delphine. This has a similar illustration style, but a very different story although Kraegel definitely adds his own twist to it. 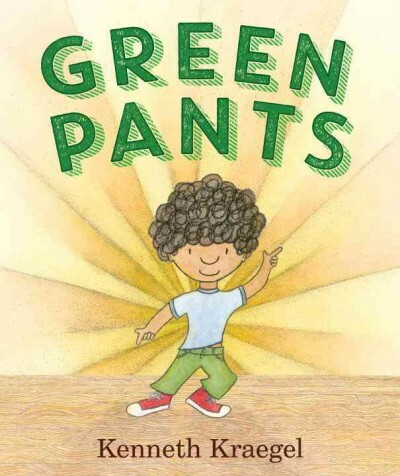 Curly-headed Jameson wears green pants, always. With them on, he can do anything including dance like there's no tomorrow! He's quite skilled at getting rid of any non-green pants and can't imagine he will ever need to change his color scheme. But then his cousin Armando shows up with his fiancee, Jo. Jameson is smitten and thrilled to be asked to be in their wedding. But then his mom breaks the news to him - he will have to wear a tuxedo. Tuxedos are black. Including the PANTS. Jameson is torn between his favorite color and being part of Jo's wedding - until he finally decides what is most important to him. He wears the black pants. Yep! But when it's time for dancing, he whips them off and underneath...are his green pants! (no, they're not underwear.) There are a number of things I like about this story. One is that Jameson (and his mom) chose not to stick to his own preferences and adapted to what Jo wanted for her wedding. He found a nice compromise even though it involved giving up something he really, really wanted - i.e. wearing his green pants all the time. I liked the message that it was more important for Jameson to do what Jo wanted in her wedding than "be himself" all the time. Like I tell the teens, you have to coexist! Another thing I like is how the illustrations portray a predominantly brown background. Many "diverse" books have a token black family, surrounded by a sea of white faces. Kraegel's art shows a loving, supportive community and family. There are some white faces in the church crowd at the wedding, but they're a minority, not the focus. Verdict: Not necessarily a storytime choice, although it might go well with a dancing theme, this is a great story to read with kids to help them think outside the box. Another scientific mystery from Sandra Markle! Incidentally, this isn't the best cover - the actual cover, while still shrouded in darkness, is much brighter. Anyways, I really like the way Markle frames her scientific nonfiction as mystery investigations. It definitely catches kids' attention and makes them easier to booktalk too! The story focuses on the research led by Kristofer Helgen. Beginning with his studies of olingos in the Smithsonian National Museum of National History, Helgen noticed that not all the stuffed specimens matched. This led to many years of research, in museums around the world, in zoos, and in the wild in Central and South America. The initial paper of his team's discovery of a new species, the olinguito, was prepared in 2006 - and rejected for lack of evidence. But Helgen wasn't discouraged - he continued to research the olinguito along with his team of scientists. 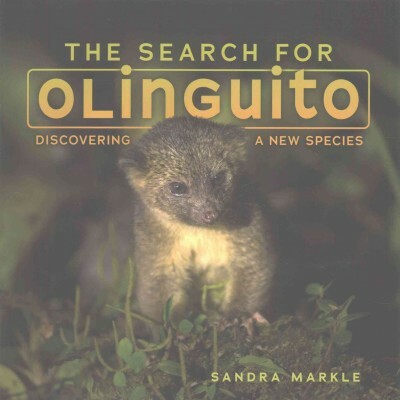 Finally, in 2013, the discovery of the olinguito was officially announced. A new species had been discovered! Throughout the book Markle includes information about the raccoon family, to which the olinguito belongs, as well as information about the scientific process and how researchers work to identify new species. There's also the history of earlier expeditions to Central and South America and how researchers use that evidence and the knowledge of local inhabitants in their research. Back matter includes questions to inspire readers to be "science detectives", source notes, glossary, and further information. Verdict: Another excellent science mystery from Sandra Markle. A great resource for classrooms and a fun read for kids interested in science and animals. This is a very incomplete list of suggested nominations for Cybils. I've garnered them from books I've reviewed, purchased, or just seen mentioned. I don't guarantee they're eligible! Also, there is a LOT more out there. A LOT! I took the rest of my vacation this week - Monday and Tuesday. I got some gardening done, some Cybils stuff (there's still time to nominate!!) but mostly, to be totally honest, I slept and read T. Kingfisher and Nalini Singh, ignoring the massive piles of books on my shelves. The sleep was needed I worked like crazy the rest of the week. I pretty much went non-stop Wednesday and Thursday. I went in about an hour early on Thursday for the three field trips, then had 13 kids at book club! It was crazy! Unfortunately, I'd kind of lost my voice by then... I worked a half-day (ok, a little more than that) on Friday and then on Saturday I was on the information desk and also had a meeting with someone from a local group (they're planning an inclusive/all-abilities park) to give us feedback on the accessibility of the garden. Phew! I accidentally picked up the second title, but it was easy to jump into the series. Wallace and Grace run a detective agency together. But right now they're placing I Spy. They're enjoying a last game before the sun rises and they have to go to bed when Monty the chipmunk calls for help - someone has stolen his cupcake! The Night Owl Detective Agency is on the case! Together they search for clues, look at the evidence, and find witnesses. But can they find the culprit - the real culprit? Even more important, can they find a solution so everyone, from Monty to the thief, can have a happy ending? Zarrin's colorful illustrations add a sweet pop of color to every page, from spot art to full page illustrations. Grace has an extra sparkle in her purple feathers and Wallace is a little bigger, with solid brown and orange patterns. But they both work equally to solve the mystery, Grace finding the final clue by remembering her earlier game with Wallace. Verdict: This is a just-right beginning chapter book for fans of Branches and early mysteries. I especially liked the vibrant art. I look forward to using these in my book clubs and strongly recommend this new series. I had sort of promised myself I would not read anything by Chris Grine again after the surrealistic experience of ChickenHare, but despite the varied reviews of his newest book I couldn't resist giving it a try. Ultimately, while I thought there were issues, I liked it more than I expected. Luke and his older brother Kyle are hanging out in the woods when they're attacked by a group of extremely nasty bullies. The bullies, who look positively prehistoric and possibly not even human, shove Luke into a dangerous pool and Kyle, diving in to save him, is killed. Months later, Luke is still caught up in his grief when his mom gently suggests he try visiting the woods for the first time since his brother's death. Luke reluctantly sets out but his attention is immediately caught by a strange explosion and he discovers a mysterious device. It turns out Luke has accidentally gotten stuck with a powerful device that allows the owner to travel through space and time and he gets pulled into a time vortex with the old professor who created the device and his mismatched group of time travelers - Abraham Lincoln the robot, the ghost of a girl which accidentally got caught in the time vortex, and their dinosaur. This odd group is trying to save the device from falling into the hands of a powerful villain. Fortunately, the villain's henchpersons aren't very impressive - vampire Napoleon, a mummy, and a skeleton. But the crew of time shifters have more to worry about than just some bumbling bad guys. They're stuck on an insect planet that's similar to the old west (except with human-sized insects that want to eat everything) and their chances for getting Luke back home are slim. After many daring deeds, narrow escapes, and a certain judicious use of ectoplasm (and a lot of insect guts) they manage to return to Luke's home planet. But the timeline is off - Luke has returned just before his brother's death. He insists on saving his brother's life, only to discover that he has been separated from his own timeline - and his family - forever. Grine's art has the colorful, cinematic quality that will be familiar to most Graphix fans. Luke is a traditionally clean-cut, white male hero and the focus of the series is on action and adventure, not character development. We don't learn much about the former life of Artemis, the ghost side-kick, except that she helps grudgingly and is rather cynical overall. There's obviously a secret sorrow in the professor's past and the robot, Abraham Lincoln, has more in common with the robots of popular scifi movies like Star Wars than his historical equivalent. There is a lot going on in this story. I think what's thrown a lot of readers is there's not really any hint about the tragedy that starts the book - the cover is very upbeat/space adventure and there's no mention of the tragedy in the description. The abrupt and somewhat dark ending may also be a surprise to readers. Grine seems to incline towards a mix of sudden tragedy, wild action, and slapstick humor which can be jolting to a reader unfamiliar with his work. Verdict: I mostly enjoyed reading it, but there are plenty of other scifi/fantasy adventures (especially featuring white boys) available. Not to mention I won't have to worry about some of my patrons who have lost siblings in tragic circumstances picking them up and being blindsided by the opening. If it turns out to be a consistent series I might reconsider, since I do have a lot of requests for this type of graphic fantasy adventure, but right now it's not what my library needs. "Manic Dr. Seuss" is how I would describe this hilarious new easy reader. 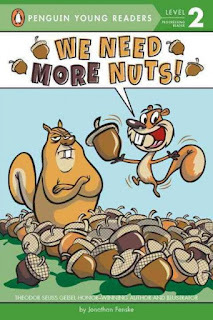 A nut enthusiast invites her audience to count with her as she juggles, tosses, and exuberantly collects nuts - all stored in the mouth of her disgruntled counterpart. Finally, having had enough, the disgruntled friend ends the nut-fest. Fenske's art just pops off the page - every line of the smaller squirrel's body vibrates and I was hysterical with laughter, especially at some of the sly scenes like the squirrel talking to herself with hand puppets. It's rare to find easy readers with genuine humor that kids can appreciate, especially when they're focused on the mechanics of reading, but this one fits the bill. I've been reading it to staff ever since our copy arrived and I can't wait to add it to other Fenske titles I use in my book club. 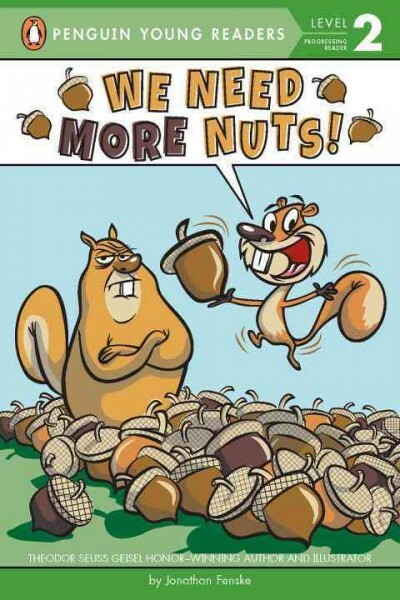 "We're going nuts for nuts today!" Verdict: A must-have for your easy reader section - buy two or three or four or more! 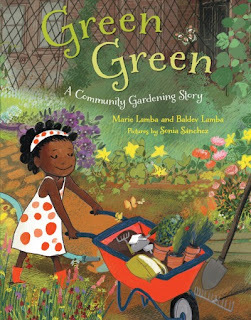 While I personally like urban gardening picture books, I rarely buy them - they're not very relevant to my community. We're a cross between suburban and rural - a class may include kids who live and work on a farm, kids with chickens in the backyard, and kids who have never been out of town and don't know where eggs come from (ok, that's a little bit of an exaggeration because of the huge county fair, but close). However, I love the illustrations and the theme of this one so much that I think I will be adding it. A racially mixed group of kids and parents enjoy the green of fields, backyards, and gardens. But when trucks and diggers come to town and start construction, "Brown brown, dig the ground." soon the city takes over everything. Now the green is in spots and windows, and in empty lots. But can they go from brown and gray back to green? With a lot of hard work, the green grows once again, sandwiched between the city buildings. Back matter includes inspiration for city gardens, suggestions for helping pollinators, and a butterfly craft. Sonia Sanchez' illustrations show the joy and exuberance of a garden and the green that grows all around, as well as the hard work it takes to clear, dig, and maintain the space. I always feel that urban garden books don't really show how much work goes into the space, but I think this book does a good job of showing all the trash clean-up and the volume of people needed to get the garden going. The pages sing with color, greens, browns, even the yellows and grays of the city streets. Verdict: An inspiring and poetic book, a great storytime choice, or a perfect pick for a garden program. I've bought some of Doug Wechsler's other books about nature, but this one really grabbed my attention. First, it's about toads. There aren't a lot of nonfiction books about toads! Second, it's a detailed, careful look at their life cycle. Third, it's perfect for an elementary audience. Close-up photos show the transformation of tadpoles to toads, with pictures so clear and real that you can see the formation of their tiny limbs under the skin! The photos cover three quarters of the page with a light blue background picking out the simple text. The text is organized by days, starting with strings of eggs on day 1 and ending with day 1099 after the adult female has mated and laid her eggs - and a new day 1 begins. There is copious back matter, including a glossary with photos, an explanation of the difference between toads and frogs, additional facts about toads, and a section on helping toads survive in the wild. There's also an author's note from Wechsler about how he took the photographs and a bibliography of books and websites. 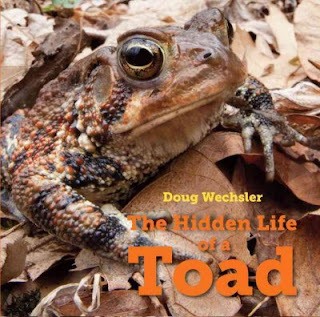 Verdict: This is a great nonfiction book for a classroom or individual child interested in toads. It would also make a good choice for a book club for younger readers. The writing is excellent and the photos are superlative. Recommended. This week at the library; or, October! 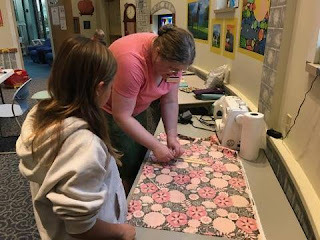 I had Monday and Tuesday off - my associates ran Craftorama and Messy Art Club. Wednesday I went to a youth services meeting in the morning and then, reluctantly, it was time to return to work. There were a LOT of books on my desk - for book club, teachers, Cybils, and myself. Then I ordered more for the next book club and for more teacher requests! Soooo much work to do. Meetings about upcoming grants and outreach to the special needs community, meetings about the garden, and a reminder of all the things I need to do - scheduling, planning, reports, orders, OY. Worked like crazy up to the maker workshop - 4 kids and 1 adult, plus one adult volunteer (circ staff who absolutely saved my life!) Very productive and everyone had a great time. I finally left at 6:30 (we close at 6!). Phew! The two friends come up with a plan and put it into action but there are a few hiccups. Little girls aren't as scared of mice as Pablo thought they were and now he's in danger of being the food himself! They're going to need all the help they can get, including Big Mike, to get out of this one - and get their treats! But will Big Mike help them out? And what happens if Ugly Cat forgets his promise never to eat mice again? There is a glossary of Spanish words included in the back and a recipe for paletas de coco. Knight's black and white illustrations show a disreputable cat with torn ear, missing fur, and fangs and a dapper mouse in vest, bowtie, and bowler hat. The layout includes a bold font for Ugly Cat's dialogue and a more stylized font for Pablo's dramatic, chattering lines. This was funny. 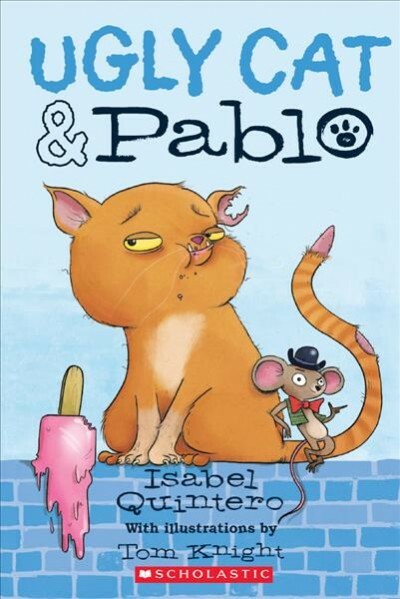 It would make an hilarious read-aloud chapter book, especially Pablo's lines "Well, what could I expect from a conniving cat like you? Fine. I'll walk into your mouth. Only because my legs are tired from running so much and I can't run anymore. Let it be known that Pablo Gutierrez Calderon de la Barca faced his finale without fear." There were a couple issues that bothered me. The fonts used for Big Mike and Pablo are very similar, adding some confusion to the story. The little girl, who is the villain of the piece, is very stereotyped. She is fat, has braces, and throws tantrums and is generally, you know, the villain. Other than these two minor issues though, this was funny and I think will definitely attract kids. The Spanish interjections are easy to figure out from context, apart from the glossary at the back, and animal stories are always popular. Verdict: If you're looking to add some more humor and diversity to your beginning chapter book series, this is a good selection. I ended up with the second in the series when I went to sample this, but I think it's fine. Sam, Arty, and Emmie have saved their town from a recent zombie infestation but there's no time to rest because another crisis is at hand! So, meet the three friends. Arty is smart - and always hungry. Emmie is the tough one, ready to tackle any danger, probably with fists flailing and feet kicking. Sam is average - average awesome that is! Smart, handsome, wait who's telling this story? 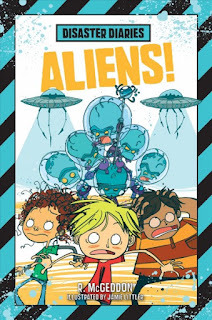 The three friends are "celebrating" Arty's birthday with lame and brain-deadening codes and a visit to the observatory when thankfully something more interesting happens - an alien invasion! At first, the three aren't sure what to think and everyone in town is excited. Who wouldn't like cute little aliens? Until they vaporize the mayor. Now, he wasn't much of a mayor but that can hardly be called "friendly" can it? It's up to the three to save their town - and the earth - yet again. Funny black and white cartoons, lists of supplies and hints for surviving an alien invasion, and other helpful remarks break up the text. This is peculiarly British humor with lots of jokes ranging from rude to crude, borderline language, and a cheerful indifference to exploded aliens, vaporized humans, and other casualties. I don't have a lot of kids interested in this type of British humor (or allowed to read it) so I tend to restrict what I buy in this area. This was funny, but I'd have to limit which kids I recommend it to. 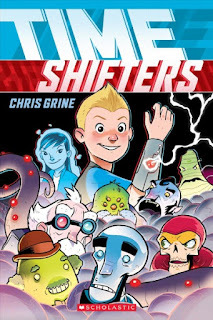 Verdict: Fans of Andy Griffiths and other slapstick and rude humor books will gleefully devour this new series, but I probably won't invest in it. Read, Read, Read, said the Baby: Peek-a-Boo What? I was pleased that the Begin Smart imprint was being revived by Sterling. These have been very popular in the past and many of our titles are started to disintegrate. This one is a variation on the classic game of peek-a-boo. Each double spread repeats the refrain "Peek-a-boo" with the Os of the "boo" being die-cut holes on the second page. The second page is a full-page flap, which lifts to reveal a rhyming word and the second part of the picture. There isn't a specific theme to the rhymes. They include a blue fish on a lime-green background on the left, lift the flap to reveal more fish on a blue background the word "blue"; a sock on the left, lift the flap to reveal a "shoe", etc. The last page shows a photo of a lion family and the rhyming word is "who?" which I found a little confusing. The pictures look like cut-paper collage and while they are not easy to guess, for this age group the fun and literacy comes from lifting and looking, while older children can practice their rhyming and association skills. This book was originally published in 2008, and I don't see anything that says it's been updated or revised. The tagline has been changed slightly and now reads "Books for Brainy Babies", apparently jumping on the baby education wagon which I don't care for, but it will sell some parents. There is a brief letter to parents that talks about the benefits of reading with your child and suggestions for interacting with the book and a list on the back of early literacy skills used in this book. Verdict: I'm happy to see these titles available again; they're an always popular series in our board book collection. Funny author Crimi teams up with Molk's gentler watercolors for a sweet and hilarious tale of getting over your fears. Sukie, a pudgy little brown and white puppy, is worried about going to the beach. Eleanor, her person, leaps into the waves with unbridled enthusiasm, but Sukie prefers to stay safely at the top of the stairs with Chunka Monka. There are just too many things she's worried about! "and, besides, there might be lobsters." Eleanor manages to coax Sukie down to the beach (ok, she actually carries her...) but it's not until Chunka Munka is in danger, swept out to sea, that Sukie overcomes her fears to save her friend. Happy to have saved her friend and proved she can be brave, Sukie spends the rest of the day safely away from the water, watching for lobsters. Molk's soft watercolors still capture the humor of the story while being sympathetic to nervous little Sukie. Eleanor is an exuberant companion, from her curly hair to her flying feet, while Sukie cuddles up in a little ball with her precious Chunka Munka. The ocean isn't particularly dark or scary, but readers and listeners who have their own fears to battle will relate to Sukie's nervousness about the unknown expanse of water. There's also a background of humorous antics by the seagulls! 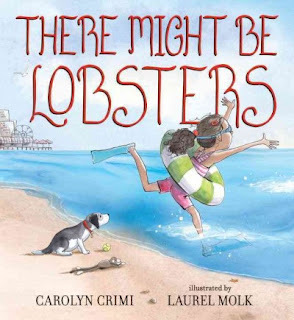 Verdict: Sweet, funny, and with a light touch of diversity in the people seen on the beach - not only racially but also in age and body type - this is sure to be a favorite summer read for many families. Patricia Newman has authored several unique science titles (most recently Sea Otter Heroes) and now she turns her attention to a subject that's not often addressed - zoos. There are several large and small zoos near my town and they are popular destinations for families. Live animals of any kind are always a draw, especially at library programs as well. But I often get frustrated when I hear parents and other adults talk about animals as just...entertainment. Complain that they're not active, want to know why their kids couldn't touch everything, etc. I make it a point to investigate any live animal programs at our library as thoroughly as possible and I support our local zoo (Milwaukee) because of their many animal conservation programs. But how to explain that to the average person who just likes to look at animals? I think this might be the book to do it. Newman approaches zoos not as entertainment, but as a "living library" and focuses on three researchers who partner with zoos to save endangered species. Dr. Meredith Bastian partners with Smithsonian's National Zoo to research orangutans. After many years of field research, Bastian now works with the Smithsonian zoo to educate children and adults, partner with conservation groups, and work with staff to create the most healthy environment possible for their orangutans. Jeff Baughman works with the Cheyenne Mountain Zoo in its unique conservation project to preserve endangered black-footed ferrets. Once thought to be extinct, the ferrets have made a come-back thanks to the dedicated work of scientists like Baughman. However, the lack of diversity in the gene pool makes it difficult to breed healthy and genetically diverse ferrets. Baughman focuses on the breeding program, but there are many other scientists and zoos who are involved not only in saving the black-footed ferrets but in educating the public about this rare and endangered animal. 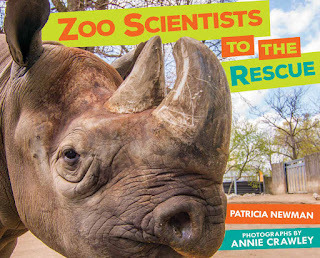 Finally, Dr. Rachel Santymire at the Lincoln Park Zoo in Chicago, is a scientist involved in conservation efforts for the critically endangered black rhino. Newman recounts Santymire's research both in South Africa and in the US and how she is using the hormones found in rhino poop to improve their breeding chances. Santymire works closely with zookeepers, those who have regular contact with the rhinos, to research their behavior. Her research is used by the zookeepers in turn to educate the public. Newman finishes the story with a brief historical look at zoos - from the earliest zoos that were entertainments to the modern zoos, as shown in this book, who focus on conservation and education. She addresses the concerns of animals being in an "unnatural" environment and being used as entertainment by encouraging readers to use the example of the scientists in this book and their local zoos to research conservation and be involved in animal welfare and science. Verdict: This is a unique look at the work of scientists in zoos behind the scenes; it offers both scientific research and opportunities for involvement. Newman looks at zoos from an educational and conservation viewpoint and will hopefully inspire readers to have a fresh perspective on their own local zoos as well as get involved in science. Recommended.